The holidays are just around the corner and with them comes a lot of cooking. A lot of cooking for a lot of people with a lot of different preferences. Making them all happy is a lot of work! So to help with “A Lot” of that, I got an idea. Have one meal you can make ahead and just throw in the oven. Whether it’s Christmas Eve or after opening presents Christmas Day, I think I came up with a solution. Lasagna! Everyone loves lasagna. I was inspired by the Italians who don’t eat meat on Christmas Eve and enjoy a bounty of pasta dishes. This tradition further developed into the Feast of Seven Fishes, seven courses of fish and pasta dishes. Now, seven courses weren’t quite what I had in mind, defeating my goal of making life a little simpler. I did like the idea of a meatless meal. Keep in mind, there is no way I’m giving up that gorgeous Standing Rib Roast or Whole Tenderloin for one of those holiday meals. 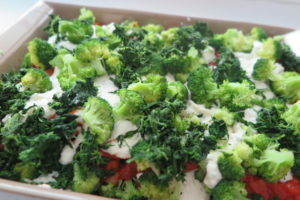 Befitting of the holidays, I kept my color palette to red, green and white; marinara sauce, veggies and cheese. Ho Ho Ho!!! Topped with a little holly; basil leaves, cherry mozzarella balls and cherry tomatoes. Viola! 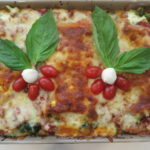 My vegetarian holiday lasagna! It doesn’t have to be meatless. You can follow the Italians lead and add some shrimp to the lasagna. We’ll call that the Feast of One Fish. You can add some Italian Sausage to the lasagna. You can bake or sauté some boneless skinless chicken breasts and serve them on the side. If you’re putting the shrimp or Italian sausage in the lasagna, add 1 pound of either one and reduce the broccoli and spinach in half. Make this up to a couple days ahead. You can make it even further ahead and freeze it. Thaw it before cooking. This is a heavy dish “literally”, so be sure to leave it out for an hour before cooking. It will cook more evenly if the dish is not cold. Heat a large 3 quart sauté pan over medium low heat. Add the olive oil, coating the bottom of the pan in a thin layer of oil. 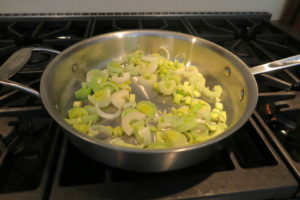 Add leeks and sauté for 5 minutes. Add the garlic and sauté an additional minute. Add all the remaining ingredients to the sauté pan. When adding the herbs, rub them gently in your palm before adding to the sauce. This will help bring out the flavor in the herbs. Stir to incorporate. 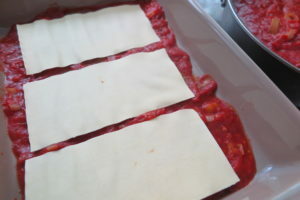 Add extra tomato paste if the sauce seems a little thin. Simmer the sauce, uncovered, for 45 minutes. Set to the side to cool. 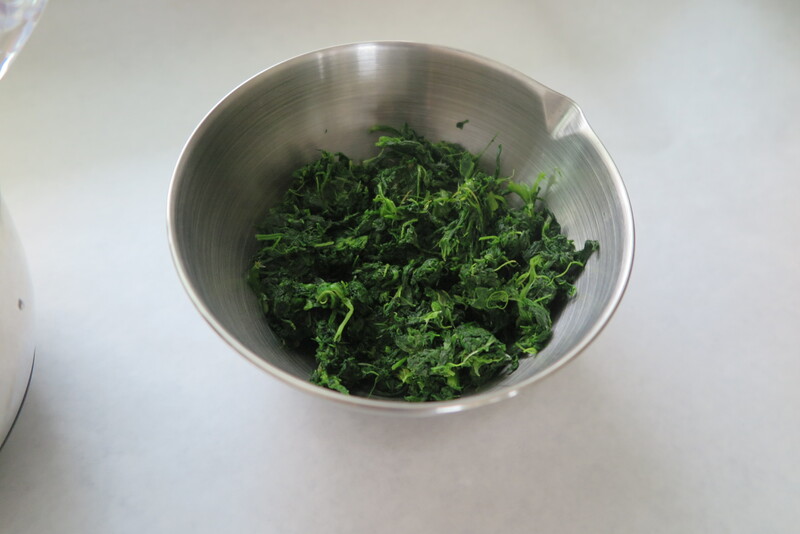 Thaw your spinach in a bowl of cold water or overnight in your refrigerator. Squeeze out excess water and set to the side. 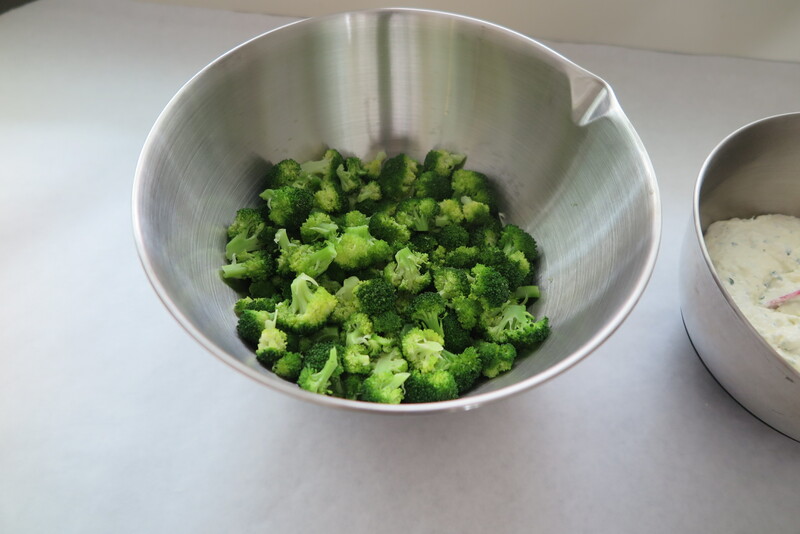 Place your broccoli in a metal colander over boiling water. Cover and steam for 5 minutes. Your broccoli should be barely tender and not soft. It will cook more in the lasagna. You may have to do this in a couple batches if your colander and pan are smaller. Set to the side to cool. 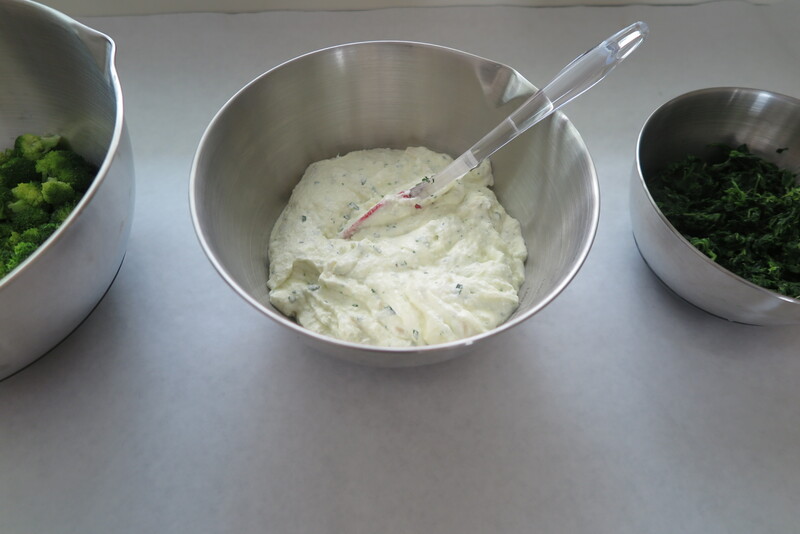 In a small mixing bowl, combine all the ingredients except the mozzarella. 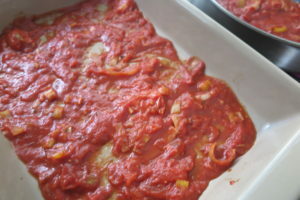 Lightly coat bottom of lasagna pan with marinara sauce. 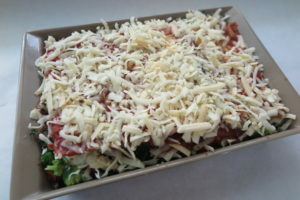 3 no boil lasagna noodles. 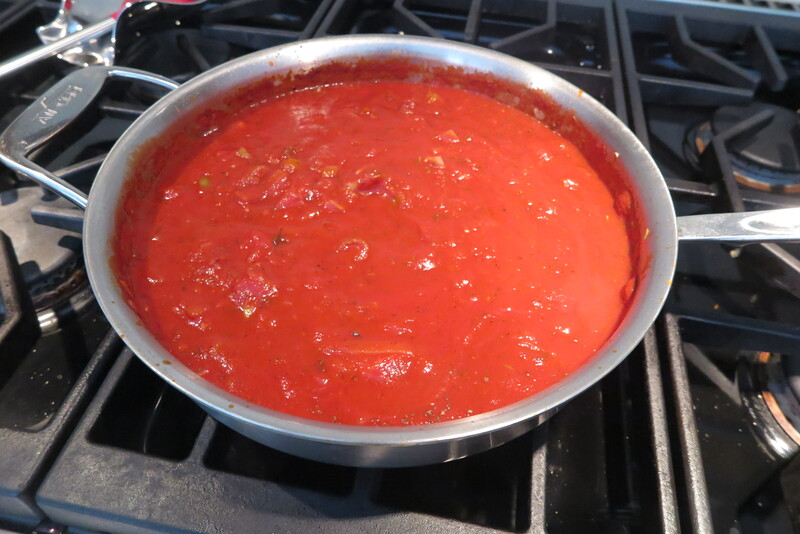 1/3 of the remaining marinara sauce. ½ the ricotta mixture, spreading out evenly. 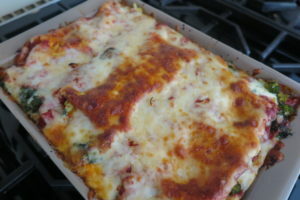 Set lasagna dish on a large baking sheet lined with foil. This will catch any juices that might boil over. Bake uncovered for 30 minutes. 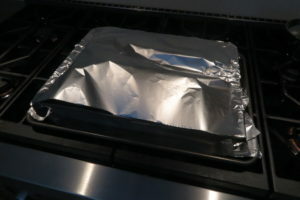 Lightly spray the shiny side of a sheet of foil with Pam. Cover loosely over lasagna. Continue baking for an additional 15 minutes. The foil will keep the cheese from turning too brown. Let rest for 10 minutes before cutting.